The weather outside may be frightful but there are beautiful glimpses of the capital at Christmas around every corner. Yesterday was mixed weather wise to say the least. As I walked from west to south and then east before back to the west I was soaked, shone on and treated to some amazing dark skies with strong sun lit architecture making for stunning views of Edinburgh in the winter. I kept stopping, unable to pass before I had either sketched, or snapped a wee photo to sketch from later. 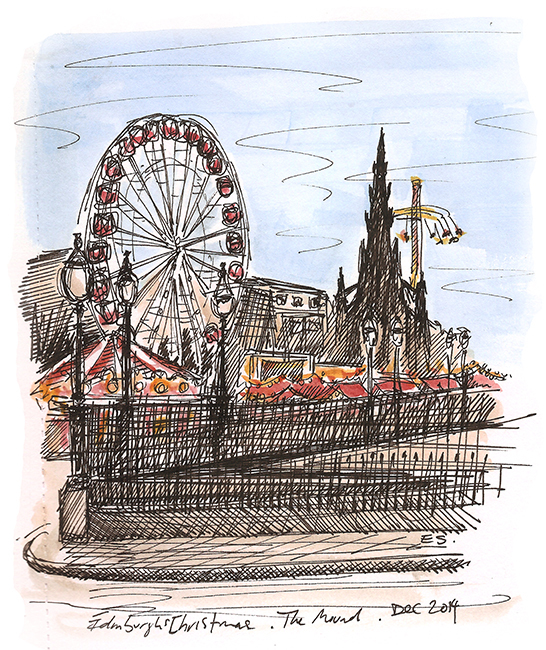 This view is from the bottom of the Mound looking across the square in front of the National Gallery towards Princes Street and the Scott Monument. I’m a big fan of Edinburgh’s Christmas make over and love the views that combine those permanent city monuments and buildings with those features that are here for a just short period of time. Have a great weekend everyone and Merry Christmas. Christine Moir liked this on Facebook. ICE Retail liked this on Facebook. Peggy Allen Hayes liked this on Facebook. I-Chun Mandy liked this on Facebook. Debbie Guerriere liked this on Facebook. Victoria She-Bang liked this on Facebook. Erica Flett liked this on Facebook. Mariota Dunning liked this on Facebook. Joanne Murphy liked this on Facebook. Kathy Callahan liked this on Facebook.